From 1996 to 1998 on behalf of the publisher 3ntini he collaborates to processing of comics and illustrations for the magazine Idea Tattoo. Since 2000, along an alternative route changing perspective on his work creating paintings. Always passionate of art and science fiction, his works reflect the influence and the mix of comics and fantasy films of the eighties and nineties (Star Wars saga and Alein) and the passion for the informal art (some painters he admires are - Emilio Scanavino - Pinot Gallizio - Roberto Crippa). 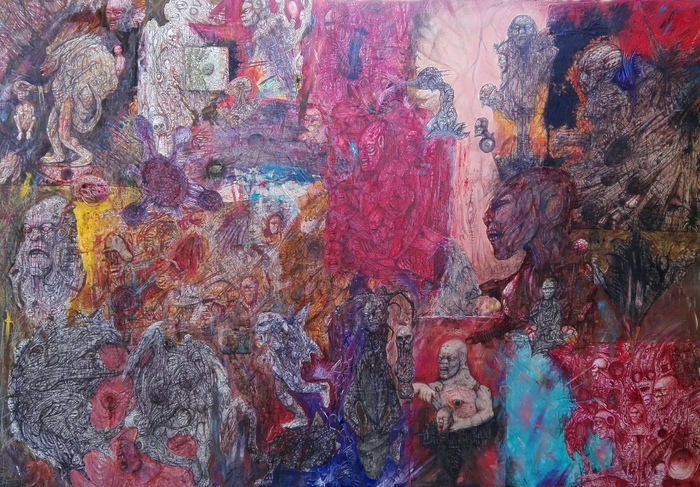 Mixed techniques used in his paintings are varied and often characterized by free brushstrokes and layers of color superimposed by using various materials such as oil paints, acrylics, markers, pencils and acrylic adhesives. Plastic inserts, Vinavil glue and latex are used for texturing the surface the framework and make beaded button. Sometimes small sculptures of monsters emerge from the canvas becoming animated within the composition. A collage of layered drawings in pen, of disturbing creatures and urban matrix fiction, are assembled to create dream worlds with signs and methods full of inner chaos and universal artist.